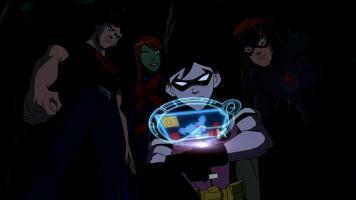 The World's Finest recently caught up with Young Justice Series Producer Brandon Vietti to discuss what's happened so far and what's to come on the critically-acclaimed, fan-favorite animated series currently airing on Cartoon Network. Young Justice focuses on the adventures of a group of junior heroes carrying out secrety missions for their big-name mentors. Though, with any great series, things are a bit more...complicated than that. Please note the following Q & A was conducted on September 26th, 2011. 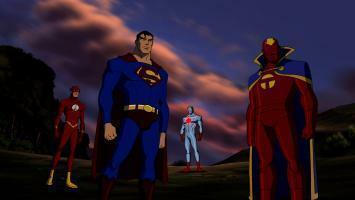 The World's Finest: Young Justice is the first TV-PG animated series for DC Comics. What type of influence does that rating have on the story decisions you make for the show? Do you even take the rating into account? Are the network censors less lenient? Brandon Vietti: I can honestly say that we've never discussed the TV-PG rating in story meetings or at any other time. In early development of the series we all agreed on two things: (1) We're going to try to capture the interests of not only the youngest kids but also the older crowds; and (2) we're going to make our show feel as realistic as we can with animation. Maybe the combination of those two points brought us the PG rating. But it was never a goal of ours to "push it to the max" with adult content just to upgrade our rating. And the network sensors haven't had any greater concerns over this series than any other that I've worked on. WF: You�ve previously worked on The Batman. How does that experience compare to making Young Justice? More responsibilities? More creative freedoms? Just how different was working on The Batman compared to currently working on Young Justice? BV: I was a director on The Batman as well as Batman: The Brave and the Bold so I only handled every third episode of those shows. I managed all of the storyboards for those episodes by directing the filmmaking of my team of storyboard artists to make sure that we were visualizing our script in the most effective way possible. I offered story suggestions for completed scripts for my episodes, I sat in on the voice recording to offer acting suggestions, and I offered input for designs as well. As a producer for Young Justice I'm involved with every aspect of production. Greg Weisman and I developed the series together after we were teamed up by Sam Register. I've plotted quite a few episodes and I work very closely with Greg on developing every single story from conception to final script.�Greg and I oversee the voice recording process with our voice director, Jamie Thomason. I�also serve as the art director for our series. Lead character designer Phil Bourassa and I worked together to develop the more modern, realistic design sensibility for all of our characters. I direct our staff of designers and colorists in creating the realistic look of our show. I work with our directors in making sure that our stories are being visualized properly and that our series film style is consistent and conveys realism. One of my favorite elements of filmmaking is music composition so I worked with our composers at Dynamic Music Partners in developing the music style for Young Justice. Greg and I work with them directly for every episode. Finally, there's editing where Greg and I oversee all the elements I just mentioned as they merge together into one finished piece. In our second season I am expanding my duties to include writing. I've always loved the story process and I've tried to contribute as much as possible in that area no matter what position I've held during my entire career. But Young Justice was my first opportunity to plot full episodes and become a real lead in the story department. It's been an incredibly awesome learning experience. Especially because I'm working with a story master like Greg every day. It's hard to not be inspired to step up your game when working with him which is why I'm now trying to add writing to my resume. Greg has been incredibly supportive to me throughout our working together on Young Justice and is now showing me the ropes of script writing. My first writing credit will be episode five of season two. WF: I�m likely a bit late asking this question, �but how did the premise for a �covert ops� take come up? Some fans have questioned the viability of it - the Justice League sending young heroes on incredibly deadly covert missions. Is there something those detractors may be missing? Is Young Justice more than just that? Will their missions become more general, more broad? BV:�I've always loved covert ops stories in comics, movies, anime, and video games. It's a genre I've always wanted to work with in animation. At the time we started developing Young Justice, we were looking for a new take on superheroes that we hadn't done before at WB so pitching the idea of a covert ops superhero team was an easy one for me. Greg had similar ideas based on existing DC books so right away we were on the exact same page. I can see why some might question the viability of a teenage covert ops team. We had to ask ourselves the same questions in that regard. But I think we explained our viewpoint on it in the first few episodes. Our teen heroes were going to venture out on their own whether the Justice League agreed to it or not. The only measure of control the League could have in the matter was to officially sanction them as a team and try to control their exposure to dangerous situations. And what better missions could they grant them but� covert ops, the nature of which is usually to avoid confrontation. I think the League had come to realize that they can't protect their teenage counterparts forever and granting them their own team would serve as a sort of right of passage into adulthood that they could oversee as their mentors. The nature of the team's missions will continue to develop as the series progresses. We have, of course, planned lots of unexpected twists and complications for those missions to keep things interesting. WF: What characters have you been surprised by so far? Have any popped out as your favorites? Are there certain characters we should keep an eye open for in the future? Are there characters to keep an eye open for? Yeah. Lots of characters. Keep watchin'! WF: Young Justice is going to be introducing us to a wide universe as the show progresses, including reinventions on familiar characters. Is it a difficult process when it comes to revamping or reinventing a character? How do you decide which ones stays �classic� and which ones get �revamped�? BV:We try to stay true to the core characteristics of each character that we interpret for Young Justice. We all love these characters from the comics. Our goals are to try to introduce them to a new audience, reintroduce them to an older audience in fresh way, and just make everybody fall in love with these characters the way we love them. Respecting the characters is our number one rule as we revamp them. WF: Are you pleased with how the first half of the season has rolled out so far (i.e., in terms of the show�s production, how the stories have come together, even its airing schedule � a very broad net, I suppose)? Any surprises? WF: Can you drop any hints on what we can expect down the line? Cartoon Network has already revealed a 10-part "Invasion" mini-series...Any hints on how the series will be building to that? Is there anything we should be watching out for right now? BV:All I can say is that "Invasion" will have unique feel as compared to our first season. We worked very hard to ground the first season in reality as much as possible by limiting the number of fantastical elements the team encounters. But our second season will explore some of the more "far out" concepts in the DC Universe. I think that's something to look forward to. WF: To veer off in a different direction for a moment, what do you think of the very devoted fanbase for Young Justice that has quickly sprung up? The show has developed a very unique following very fast. Any thoughts on that? Is it flattering to know just how much fans have taken to this series despite being still relatively new? BV: All I've ever wanted to do in this business is make great stories. From the positive feedback I've seen from our online fan base I am extremely gratified. We must be doing our jobs right. I particularly love seeing all the fan art inspired by our show. I had one of our bulletin boards at the office turned into a wall of fan art so everyone on the crew could see how their work was inspiring others. And in turn the fan art inspires us. Knowing that we're making our fans happy just makes us want to work harder. WF: How would you sum up Young Justice so far, including your experiences working on the show, and what can we expect in the episodes to come? BV: Producing Young Justice has been an amazing experience. I've got a great crew to work with and I'm proud of what we've accomplished together. As I write this only 11 episodes have aired. That's just enough episodes to lay the ground work for the series and establish our main players. Life will get more complicated for our team from here on out. The plot will thicken for each of our characters as the pressures of their work and personal lives affect them in ways they never considered when joining the team. The motivations of the bad guys will become more clear as things progress and what you learn in future episodes will deepen the meaning for certain events in past episodes. We've tried to create many layers with this series so that you'll be able to watch each episode multiple times and almost always be able to find something new. The World's Finest would like to thank Brandon Vietti for participation! Again, please note this interview was conducted on September 26th, 2011.